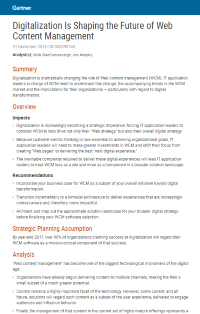 Download this white paper to find out how digitization is dramatically changing the role of Web content management (WCM) and how digital leaders can use it as a strategic imperative. Web Content Management has become one of the biggest technological advancements of the digital age. As content continues to influence customer behaviours and is the key tool to drive engagement, companies can’t afford not to optimize their digital strategy to increase user experience. IT application leaders in charge of WCM must approach selecting WCM software in a different way and understand the context of digital transformation to successfully engage the right audience.